The audience for the Indiana University Baroque Orchestra’s performance of Ignaz Holzbauer’s Hypermnestra will hear more than music at the College's Salter Hall on February 22nd. They’ll hear musical history—a rediscovered masterpiece that has not been performed for more than 260 years. Wabash Professor of Music Larry Bennett has already heard a sampling. The man who rediscovered the opera and has been editing or writing about it ever since got a chance to listen to the music for the first time as the orchestra rehearsed last week. "The music sounds glorious, and they're all going to sing beautifully," says Bennett, who has been shuttling between Crawfordsville and Bloomington to assist with rehearsals. "It’s thrilling to hear a piece that you’ve looked at on paper for years." Bennett says that IU Baroque Orchestra Conductor Stanley Ritchie "has a great grasp of how to put it all together, how to make it an effective piece." "It’s going to be beautiful," Bennett says of the the piece, which was composed in 1741 and may be the first German-language opera written in Vienna. English translations summarizing each act of the opera will be projected on a screen, Bennett says. "With those translations, the audience will get a lot of fun out of it—understand what’s happening and be able to take in the music," says Bennett. Based on a Greek tragedy in which a young woman is compelled to choose between loyalty to her father and love for her husband, Hypermnestra was re-discovered by Professor Bennett in 1995 during a research project in Meiningen, Germany. Bennett calls the opera "a darned good piece of music with all the goodies you expect in an opera— treachery, jealousy, love—along with awe-inspiring writing for voices." The collaboration is a first between Wabash and the Indiana University’s School of Music. "We're very pleased to be working with Professor Bennett, the 'discoverer' of this dramatic opera," says Michael McCraw, director of the Early Music Institute at IU. "Thanks to his efforts, the work will also be published in the most important collection of Austrian music." With the orchestra playing on instruments modeled from the 18th century, the audience will hear both a historically authentic and history-making performance. Hypermnestra is the spring semester's first Visiting Artists Series production. Seating for Visiting Artists Series events will be by general admission, though free tickets are required. Contact the Fine Arts Center Box Office by email at boxoffice@wabash.edu; or phone: 765-361-6411. Box Office hours are Monday through Friday, 8:30 a.m. to 12 noon and 1:30 to 4 p.m. The box office will open 90 minutes before curtain time for Visiting Artists events. Tickets not claimed at the Box Office 10 minutes prior to curtain will be released to the general public. 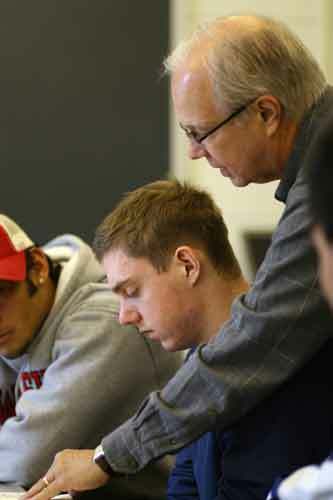 In photo: Professor of Music Larry Bennett in the classroom with Wabash students.